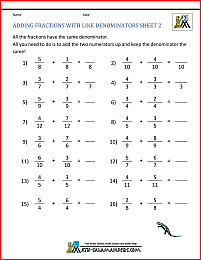 Welcome to our Free Fraction Worksheets page. 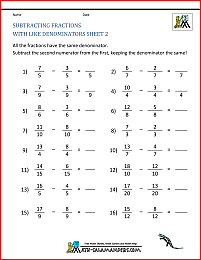 Here you will find a wide range of free printable Third Grade Worksheets about Adding and Subtracting Fractions with like denominators, which will help your child with their fraction learning. 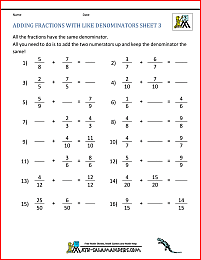 Here you will find support pages about how to add and subtract fractions (with both like and unlike denominators). How do you add Fractions? If you want to use our Free Fraction Calculator to do the work for you then use the link below. Our Fraction calculator will allow you to add or subtract fractions and show you the steps to work it out. Otherwise, for more detailed support and worksheets, keep reading! Find out how to add and subtract fractions with like denominators using the video below. 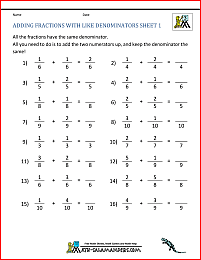 Here you will find a selection of Free Fraction worksheets designed to help your child understand how to add and subtract fractions with the same denominator. The sheets are graded so that the easier ones are at the top. add and subtract fractions with the same denominator. All the free Fraction worksheets in this section support the Elementary Math Benchmarks for Third Grade. 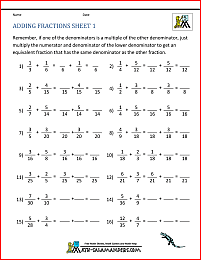 If you need to add and subtract fractions with unlike denominators, then we have a page dedicated to this skill. Here you will find a selection of Fraction worksheets designed to help your child understand how to work out fractions of different numbers, where the numerator is equal to 1.
know how to calculate unit fractions of a range of numbers. Here you will find a selection of Fraction Flash Cards designed to help your child learn their Fractions. Using Flash Cards is a great way to learn your Fraction facts as parts of a whole. They can be taken on a journey, played with in a game, or used in a spare five minutes daily until your child knows their Fractions off by heart. practice their equivalent fraction facts. 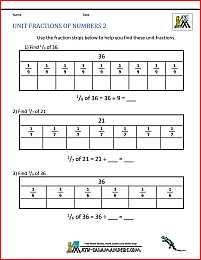 All the printable Math facts in this section support the Elementary Math Benchmarks. 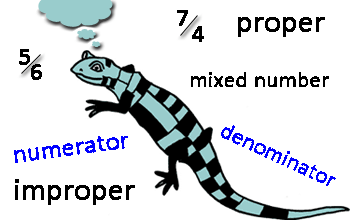 Here you will find the Math Salamanders free online Math help pages about Fractions.